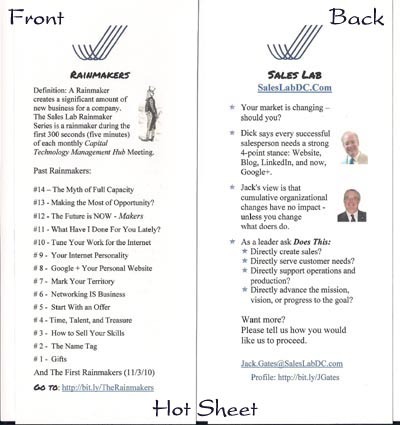 When I meet someone, I give them a large two-sided card with information about topics, my blog posts, and items of interest that the person will find useful, in addition to my contact details for Sales Lab. We call it a Hot Sheet. During our conversation, I will circle an item on the Hot Sheet if pertinent, or can write a URL or other reference in the margin for use later by the recipient. It is easy to update or change and I can print as many as needed for upcoming meetings. 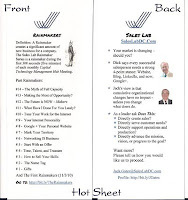 Usually, each time I see a person at a meeting or event, the Hot Sheet is newly revised. I was at a meeting of YPLG (The Young Professional’s Leadership Group) this week and was talking with a person who knew me but was trying to place where we had met. When I gave him a Hot Sheet, he immediately remembered where and when we met – and he said he still uses his original Hot Sheet as a technical reference. In addition to its unique size and content, the Hot Sheet is memorable to the recipient. How memorable is another business card for your pile? Which has the best chance to begin a relationship? I like my own handout. And if I find something someone else wrote that I really like, I'll hand that out. Some of the lost posts of Marc Andreessen and ESR's The Cathedral and the Bazaar were two I used as handouts.